This Trick Is Stumping EVERYONE! Can YOU Figure It Out?! 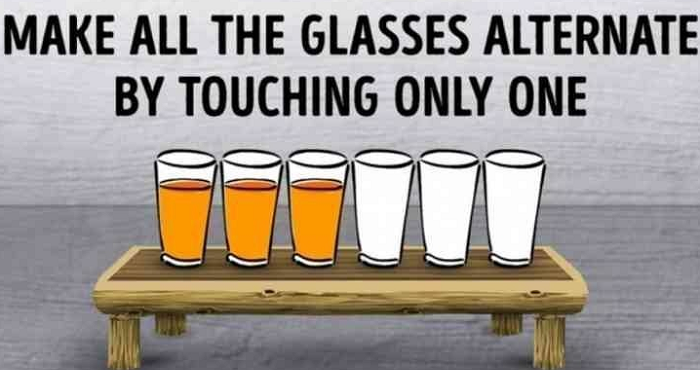 You can only touch a single glass! How do you do it? Nudge them over without letting go of the single glass? Is it cheating if you just use one empty glass to push the rest of them in the correct places?! The answer turns out to be a lot easier than that in the end. First, pick up the second glass filled with juice. Next, sigh, as you realize just how simple this riddle was to figure out. Then, pour the contents of the glass into the 5th glass. Finally, place the now-empty glass back into its spot as the second glass. If you figured the riddle out in no time, then congratulations! You happen to be smarter than the average person who couldn’t figure it out! The simplest riddles are usually the best, and this one is pretty awesome!